Great for a party, this week’s Health-e-Recipe for Greek Turkey Sliders offers more than just mini-burgers. We’ve moistened lean ground turkey, a healthy substitute for red meat, with a lemony marinade made with garlic, oregano and olive oil – classic Greek flavors. Adding spinach and feta cheese into the burgers themselves keeps the Greek theme going. Along with the garlic and spinach, red onion and tomato add cancer protection. With cucumber and lettuce, you’ve got high water and fiber content from veggies. The contrast of hot burgers and cool veggies in one bite make for a super summer treat. To find more cancer-fighting recipes, visit the AICR Test Kitchen. Click here to subscribe to our weekly Health-e-Recipes. 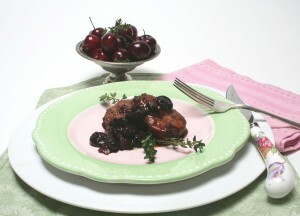 This week’s elegant Health-e-Recipe – Pork Tenderloin with Pomegranate Cherry Sauce – shows you how smaller servings of red meat can be totally satisfying when cooked with plenty of cancer-fighting flavors. A lean cut of pork, tenderloin absorbs the fruity flavors of cherry and pomegranate, both rich in protective phytochemicals, in an easy-to-make sauce. Shallots, a cancer-preventive member of the onion family, plus healthful thyme and mustard are simmered together in fat-free, reduced sodium chicken broth and the pomegranate-cherry duo. Gently cooking the meat in this sauce yields a satisfying dish that goes great with other cancer-fighting foods filling at least two-thirds of your plate, like steamed spinach, carrots and broccoli plus a whole grain like wild or brown rice. That’s the New American Plate model for your meals that AICR recommends. For more excellent cancer-fighting recipes, visit the AICR Test Kitchen. Click here to subscribe to our weekly Health-e-Recipe. You may already limit red meat and avoid processed meat to lower risk of colorectal cancer per AICR’s recommendation. But do you puzzle over calories, fat or what 85% lean means when trying to choose “lean meat and poultry”? If so, the new meat labeling law may help you out. 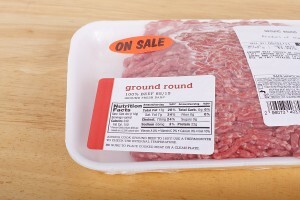 As of March 1, you’ve been able to see calories and grams of fat in fresh ground meats right on the package. For “major cuts of meat” (meat that isn’t ground), you’ll find the information either on the package or on a poster or brochure near the meat.